CADBURY ROSES continues to modernise with a number of new and reinvented flavours, as well as new packaging to lock in the freshness! CADBURY ROSES chocolates have been one of Australia's most loved and iconic ways to say thank you since the brand was launched in Australia 70 years ago. Over the years, the brand has continually evolved to reflect the changing tastes of consumers, featuring flavours like Mandarin Cream in the 50's, Peppermint Cordial in the 70's and Lemon Cheesecake in the early 2000's. Today, CADBURY ROSES is excited to share its next evolution, introducing a number of new and reinvented flavours, as well as new packaging. The classic flavours have been reinvented to appeal to today's consumers by adding more indulgent layers and textures. An example of this is the classic Peppermint Crème, which has now evolved to the Peppermint Crème Crunch, adding the texture our consumers are telling us they want to classic flavours. Other reinvented flavours include; Hazelnut Crème Crisp, Turkish Delight, Hazelnut Swirl, Caramel Deluxe, Classic Caramel, Dark Mocha Nougat and the Classic Milk. New additions to the range include: White Raspberry, the first ever white chocolate variety in the CADBURY ROSES range, that boasts creamy CADBURY white chocolate blended with delicate freeze-dried raspberries; and Vanilla Nougat, a fluffy textured nougat with crispy pieces dipped in CADBURY milk chocolate. Each of the delectable CADBURY ROSES chocolate fillings has been paired with the CADBURY chocolate that complements and enhances the flavours and textures on the inside. 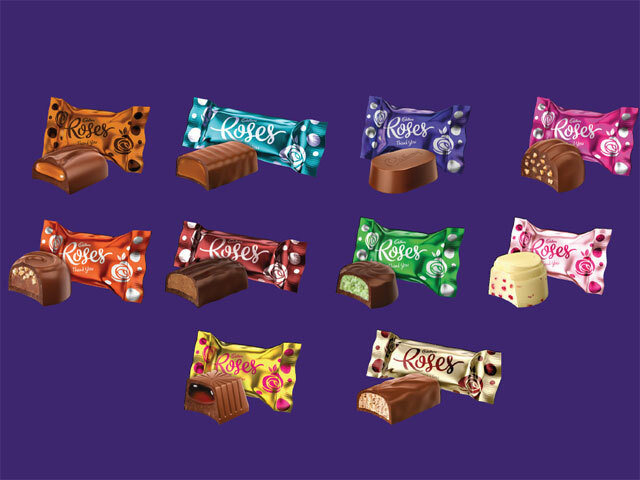 Additionally, the shape of each CADBURY ROSES piece has also been modernised with a more rounded and smooth shape. As well as contemporising what's inside the packaging, the CADBURY ROSES wrappers have also had an exciting update. In response to considerable consumer feedback, CADBURY ROSES has introduced sealed 'flow wrap' to lock in freshness and flavour. Now, each CADBURY ROSES piece will be sealed fresh to prevent accidental unwrapping and minimise flavour transfer between pieces. Officially launching in Australian stores in August 2018, the updated and modernised CADBURY ROSESchocolate box makes this timeless classic an even more special way to say 'thank you'. "This new evolution of CADBURY ROSES reflects the changing taste preferences of consumers and addresses customer's valid feedback - no more pesky empty wrappers or unwrapped chocolates floating around in the bottom of your box of CADBURY ROSES. "Say an extra-special thank you to someone with the latest evolution of CADBURY ROSES today," says Melanie Yates, Senior Manager Marketing at Mondelēz International. The new CADBURY ROSES chocolates are available at all major retailers.